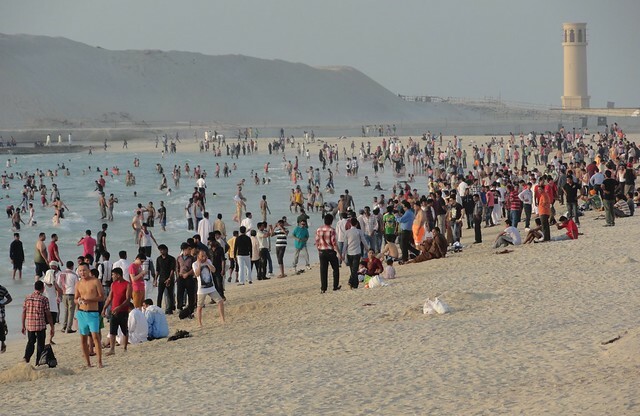 Umm Suqeim beach is popular for its favorable conditions for surfing. A surfing school, Surf Dubai, is also situated on the beach where training is provided and boards are rented. People come here also to enjoy the spectacular sunsets and strolling on the beach which is shaded by the magnificent Burj Al Arab building. Facilities include showers and changing rooms. The beach gets crowded in October through April months when surfing rises to its peak. There is a beach park across the road which has a café and playgrounds for children. Only women and children are allowed on the weekdays and is open to men only on weekends.